Blizzard has announced a new piece of Diablo 3 Merchandise, and what seems to be a sequel to the Book of Cain. Coming later this year. It’s the Book of Tyrael. This 148 page hardcover book is set to release this October, and it features never-before-known stunning original art and writings from iconic Diablo series characters such as Leah and Deckard Cain, as well as a fully removable family tree. Book of Tyrael cover art. That’s the whole blurb, and the only visual is that embossed-looking cover. This seems like a continuation of the lore we got in the Book of Cain, and is the sort of thing Blizzard would want to release as a teaser and primer for the lore and story we’ll see in the first Diablo 3 Expansion. 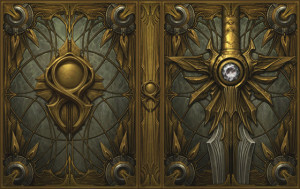 For the sake of comparison, the Book of Cain was revealed in 2011 and teased repeatedly, with the release date backed up along with Diablo 3’s. It was said to be coming in the Summer, than the Fall, and was finally released in December, with book signings around that time. Diablo 3 didn’t appear until nearly 6 months later, but that was due to it being delayed repeatedly, from 2011 to Q1 2012 to Q2 2012. 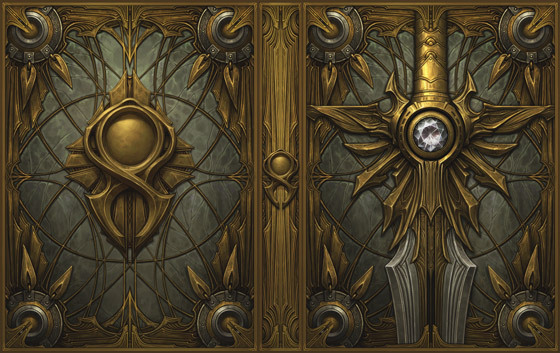 Can we read something into the Book of Tyrael being targeted for October 2013, in terms of when we’ll see D3X? Well… that would be pretty optimistic, as most of us expect D3X to be revealed at Blizzcon in November, and Blizzard (in recent years) never announcing any expansion less than 12m before its release. But as life online proves every day… it’s fun to pretend. The funniest thing about Book of Cain? It was delayed. I couldn’t get a hold of it until about two weeks after it was supposed to ship. Even Sword of Justice was late (but not as bad as some comics). Tyreal was gay. Don’t want to read a book written by gay. Leah’s been reading the Book of Tyrael. You can see it on the floor of her room in the Armory, Act III (below the usual town area). It’s next to her stool by the table with all the candles. Please note the DIAMOND in the heft of the sword. Can we now safely surmise that Diamonds will be making a return in D3X? This will go nicely next to my book of Cain. I bought the Book of Cain before Diablo 3. Loved the book, its looks and the paper map of Sanctuary. Won’t even consider buying the new book though; the Diablo 3 game made it clear that putting any stock in the Diablo lore would be a waste of my time. The game itself is shaping up nicely after a good amount of patches, but the godawful story and storytelling will be burnt into my memory forever. I know well what you are talking about. I must confess I was excited for a few seconds, but you don’t fool me anymore Blizz. When the expansion comes out, it’ll be like watching a terrible movie adaptation of the best book you’ve ever read. Just like D3 and Book of Cain was.